One of the people I follow on Twitter is Pastor Ronnie, one of the Pastor’s of First United Methodist Church in Hillsville Virginia and FUMC Downtown “Out of the Box”, Youth Ministry. 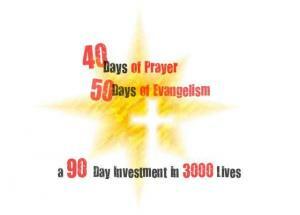 He’s been blogging about a 90 day investment in 3000 lives: 40 days of prayer, 50 days of Intentional Evangelism. He’s been in a 40 day fast and prayer time that has now ended. He journals about it on his blog. He’s prayed for his evangelism efforts. In a recent post of 50 days of evangelism, he gives an awesome list of practical evangelism ideas. I repost them here with permission. Pray about 5 different people that God would put on your heart to pray for during these 50 days of Evangelism and pray for them each day. Look for someone who needs help by opening the door/going out of your way to show God’s grace and love. Take some “goodies” to Fire Hall/Police station/Oncology group, etc. Place a note that they are from a Christian Friend. Take some time to share your faith with a child. Visit a nursing/assisted living place and take flowers and or goodies. Remind them of God’s love for them. On your day off, call someone you know who lives alone; ask them to name one thing you can do for them. Tell them how great God is. Tell a youth at church, even if you don’t know them, how good it is to have them in church. Make sure your kids know Jesus Christ as Savior thru phone call, in person, or a card. If you save coupons, take some and hand out to folks downtown at the educational facilities. Get the phone book out today and find 5 names at random. Pray for each to be strengthened in their faith or to become a Christian. Write a note of encouragement to someone you know who has not been coming to church and tell them how much they are missed. Make some cookies to take to a neighbor. Tell them it is something your church is doing and invite them to come Sunday. Take some bottled water and goodies to the Same Day Surgery waiting room. Tell them it is just a way to live your faith out if they ask. Pray for all the people on your street to know Jesus Christ as their Savior and/or for their faith to become stronger. If you work in an office, carry a stick-it note pad. Write a little pick me up on it with a scripture verse they can look up. Le them know you care. Leave something little (tin of mints, daisies, etc) with a note that says God loves you. Pay for the person’s food in the line behind you. Have the employee tell them it is from a Christian friend and that God’s love should be passed along. Encourage someone today with how God has brought you through a difficult time. As you have prayed for the 5 people for 20 days now, ask God if there is something He wants you to do for them. Take a walk in your neighborhood or park and send up a prayer to God for those you pass by. Go out of your way to befriend someone you have been at odds with. If someone tells you they are having a rough day/time, ask them if you can pray for them right then. Volunteer to help a child today that you know needs some special time. Pray for those in prison today and if you know of someone close to this situation, send them a card telling them you are praying for them. Take some new coloring books and crayons to the children’s ward at the hospital. Take a food basket to a home bound person today and remind them of God’s love. Pray a special prayer for all the children who will go to Buffalo Mtn camp this summer; that they will know Christ and walk close with Him. Send a note of encouragement to a single mom today and tell her what a great job she is doing and remind her of God’s love and provision. Encourage someone who is looking for a job. Take them an outfit to wear for interview or help them with resume, etc. Offer to keep a neighbor’s child/children for a couple of hours. Remind them that God wants them to take time for themselves. Pray with your spouse and/or children unexpectedly today. Love and pray for an enemy today. (I know you have one). Share with someone today about God’s goodness. Open the phone book and select a name at random and send that person a Christian greeting card. Tell some that waits on you today (grocery, restaurant, etc) how much you appreciate them and what a blessing they are. Spend time doing a Prayer-walk. Pray for those who do not know Christ. Take some bottled water to a park and hand them out. When they ask you why, tell them you are trying to live out your faith. If you see someone unusual today and start to judge; DON’T. Instead, say something kind to them. Share your faith story with someone God puts in your path today. Next time you leave a tip for someone, leave them a card of encouragement. Reach out to someone you have been avoiding. Pray about asking someone to come and join you for the Renewal Services. Take your grand children or child you know to somewhere special today. Tell them how much Jesus loves them. Invite someone to come to the Pentecost Celebration Sunday. Thank God for all your blessings and pass some of those on in whatever way God leads you to. Incorporate at least 2 of these ideas into your everyday life. I bet you never realized what “evangelism” is! Ronnie is blogging about his 50 days, one day at a time. Go to the ImageBearer blog and grab the feed to follow his adventures.